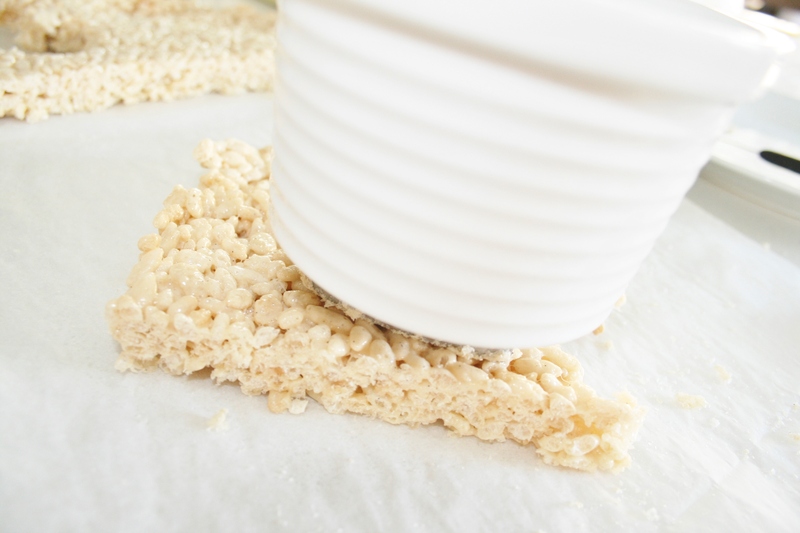 Rice krispie treats, did you have them as kids? I can remember they were one of my favourite treats. And I still love them! Although they don’t exactly scream sophistication and maturity, I recently made them to take to a baby shower and dressed them up just a little. 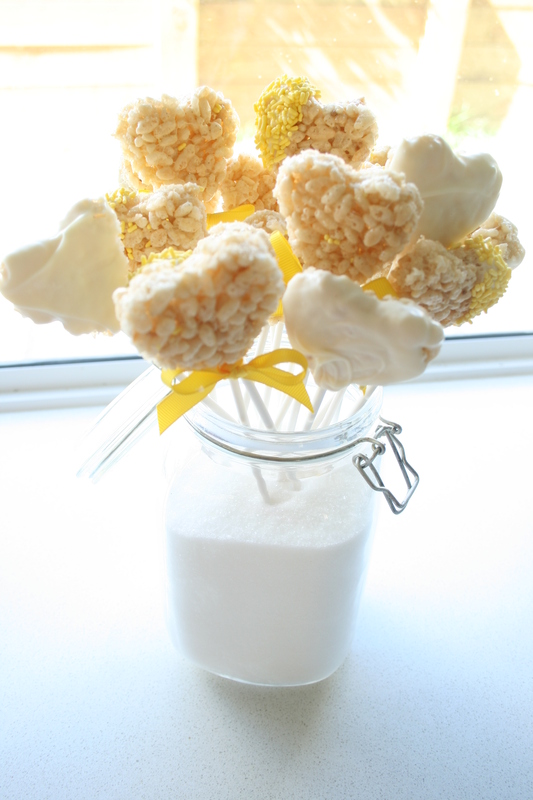 I cut heart shapes out and stuck them on cake pop sticks then dipped a few in white chocolate and covered them in yellow jimmies. Then stuck them all in a jar full of sugar. I actually really wanted to make cakepops but just did not have the time, and these seemed like a good alternative made in a fraction of the time. I found a bit of a grown up version of the recipe, which tasted even better than what I remembered them to be. You can find the recipe here on Zoe Bakes. I feel like whipping up another batch right now. It is seriously good. Even my husband who hates marshmallow thought they were nice (after begging him for hours just to take one bite). I used vanilla paste because I did not have any vanilla beans on hand, I’m sure vanilla extract will work as well. And next time I will use ½ cup less rice krispies, but that’s personal taste wanting it more gooey and marshmallowey. A couple of tips I found worked well, I kept on re-heating the slab to make it more pliable and easier to cut out into shapes, and I used a ramekin to push down the heart cutter which was a lot easier and less painful! Oh and buttering your hands and everything else you use really helps. ← half birthdays; it’s a thing. Hi Flora thank you so much! I already started following your blog I think it is lovely!! Love the photo’s you’ve got in your header 🙂 It’s awesome what you are doing at your age, I’m looking forward to reading more of your posts! This is basically my childhood (and technicially still is seeing as I still feel like a child). 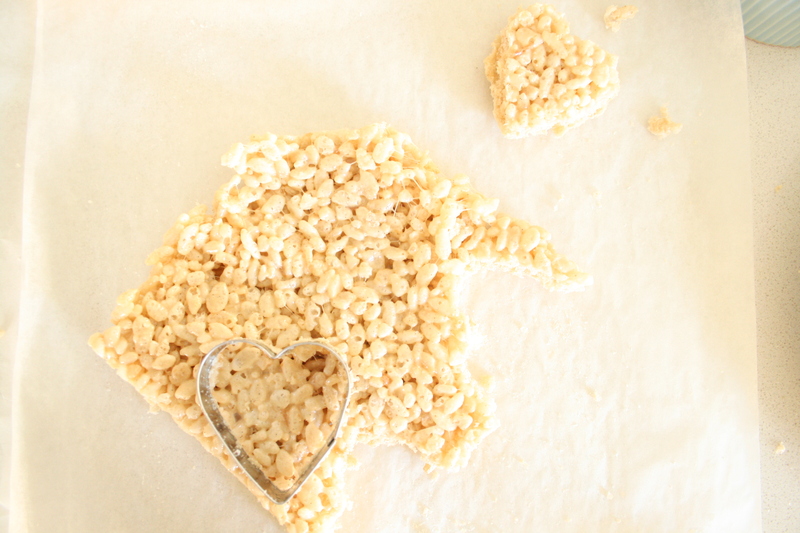 Never too old for rice krispie treats! Dear Es thank you for your tips. I tried to do these the other day but I completely demolished my poor cookie cutter because the mixture becomes quite solid. Yum, such a cute idea! I love that you jazzed them up a little by cutting them into hearts.